GULF Marine Services (GMS), founded in Abu Dhabi in 1977, has built on its strong foundations in the UAE to become the largest builder and operator of self-propelled self-elevating accommodation jackup barges, not just in the Middle East, but also worldwide. The company, which has been providing offshore support vessels to Adnoc for more than 30 years, recently announced a strategic new-build programme that includes the addition of a new design to its current fleet. Four new vessels, capable of global operations in the oil, gas and renewable energy sectors, are planned and will be built at the company’s yard in Mussafah. The first, GMS Enterprise, is already underway with the project set to bring up to 600 new jobs to Abu Dhabi; this vessel will be ready for new contracts in quarter three 2014. The new S-Class jackup design will bridge the gap between GMS’ existing seven K-Class assets currently operating in the Middle East in water depths of up to 45 m and equipped with 36 and 45 tonne crane options, and its two E-Class harsh weather dynamic positioning (DPII) vessels currently working in the North Sea and suitable for worldwide operations in water depths of up to 65 m and with 230 tonne and 300 tonne cranes. Duncan Anderson, chief executive officer at GMS, says: “We’ve seen a major increase in demand for our jackup barges over the last five years. As a result, we are currently building a third E-Class vessel in our yard in Abu Dhabi with this capable of working in even deeper water, up to 80 m, and with a larger 400 tonne crane; we also have an option to build another of these large units. The S-Class will have DPII and will operate in depths of up to 55 m, however it will be a smaller and more utilitarian harsh weather barge than the E-Class. It will have 800 sq m of deck space, a 150 tonne main crane, a 15 tonne auxiliary crane, and will accommodate from 150 to 300 people. 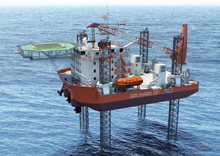 The S-Class jackups will be used for well services in the oil and gas sector and for offshore wind farm maintenance, in the Middle East, northwest Europe, South East Asia and West Africa. Through its new build and renewal programme, the company has ensured its fleet is the youngest and most sophisticated in the industry, currently with an average age of just nine years, compared to a global offshore average of 24. K-Class jackups: Four legs; suited to operations in the Middle East, Asia and West Africa, operating in water depths of up to 45 m; 36 tonne and 45 tonne crane capacity; speed 4 knots; 150 people on board (POB). S-Class: Four legs; DPII; suited to global operations, operating in water depths of up to 55 m; speed 7 knots; 150 tonne crane capacity; 150 POB; delivery Q2, 2015. E-Class jackups: Four legs; DPII; suited to global operations, operating in water depths up to 65 m; speed 8 knots; 230-300 tonne crane capacity; 150 POB. GMS Enterprise: Water depth 80 m, 400 tonne crane capacity; delivery Q3 2014. GMS also operates two anchor handling tug supply vessels in the Middle East – Atlas and Helios.